[Johny Lee] sent in his(pdf) awesome projector calibration project. By adding embedding some optical fiber that feed into a set of USB connected light sensors, his groups software can determine the exact pixel position of each sensor. Once the positions are determined, the projected image can be dynamically adjusted to fix the screen. The technique can be used to stitch together multiple projectors, and even calibrate an image to project onto a three dimensional model. I know some home theater nuts that would love to have this system for calibrating their CRT projectors. This is such an excellent project, that I want to give credit where it’s due – it was developed by [Johnny C. Lee], [Paul H. Dietz], [Dan Maynes-Aminzade], [Ramesh Raskar] and [Scott E. Hudson]. Be sure to check out the video demo after the break! That is bloody amazing, especially the demo with the car! Great Job!! That is quite an impressive demonstration there. I rarely ever comment, but man, that’s awesome. Wow, I can’t believe how well that works! I wonder why nobody thought of this before… but the problem with the car demo is, that it still requires the geometry to be known beforehand in order to wrap the image correctly. This could get really big when laser projectors (using moving mirror galvos to steer the beam) become affordable, as you can then adjust the field of view of the projector on the fly, and the images are always in focus. Aside from that, that is an awesome setup. I envision some code to allow beryl/compiz (sorry windows/mac users) to have several small (or large for that matter) panels that can be mapped to an individual window. So you can drag/rotate/etc each of your windows on say a physical desk. It must be possible to do the calibration in way less time. Consider the projector has about a million pixels. To uniquely identify each pixel, they must each be given a code about 20 bits (frames) long. The codes would be arranged so two adjacent pixels are different in only one frame. (basicly gray code with an extra dimension, so X and Y can be calculated simultaniously). That means positions can be calculated with only 20 frames, and with a 60Hz refresh rate it should only take a third of a second to identify a pixel (ie. 3Hz). That means it becomes practical to track moving objects using an IR projector (because you can do motion prediction and also you can presume the area certain pixels are in by their previous location, reducing the number of frames required to deduce a location). For fast-moving items, accuracy is also less important again reducing the number of frames. I guess it would be possible to then track an item to about 10 Hz, which could have some interesting uses. It would be possible to further speed up the process by using all 3 colour channels seperately and have detectors for all 3 colours on the ends of the fibers. Another interesting ofshoot is it might be possible to do sub-pixel positions by measuring intensity. Suppose a camera was added close to the projector, and the background was a random, inconsistent image, rather than a solid-gray one. First, the camera takes a picture of the background and remembers it. Then the camera records the binary pattern, from which the offset relative to the projector can be determined; the background should not be a problem to calibration because a previously-recorded image may be used to filter out the graphical background noise. Next, the still-flat-gray model car with the optical sensors is placed on the background. The calibration does its thing like in the demo so that the colors can be projected correctly onto it; however, this should also provide enough information to project a piece of the background over the car such that it becomes sort-of-invisible from the point of view of the view of the camera, or if multiple projector-cameras are used, sort-of-invisible from a single arbitrary point of view. Love this post. I can’t help but dig up an older article from Technology Review (late ’04) that focused on one group’s work with hand held projectors, aiming to shrink them enough to replace/augment cellphone/PDA displays. Some of their tricks included adaptive projecting onto uneven surfaces, keeping a steady image despite moving the projector (so you could tilt and point the projector like a mouse/laser-pointer), and automatically unifying several projectors for an even larger image. So that was baseline already pretty cool. But they took it a bit further and got RFID tags involved that each had a photodiode sensor. They then ran a similar scanlines projection (like this project uses) across a scene, and identically they could exactly locate where the sensor was. Their working example was a storage shelf with different cardboard boxes and embedded tags + sensors, and they would project graphical information for each box onto the side of each box. Incidentally, this seems to be the same guy who came up with the hack of using the Wii remote’s IR sensor and an array of IR LEDs to track finger positions. It gets better, a DMD can slam out binary frames at 14,300 Hz and the sequence is short (on the order of 20 frames) so you can get a fix in about 1.4 milliseconds and after you have an absolute fix you can use coding tricks to drop the number of frames to do relative tracking, I’d put it at about 8 frames with a periodic 20 frame burst to cancel out cumulative errors. 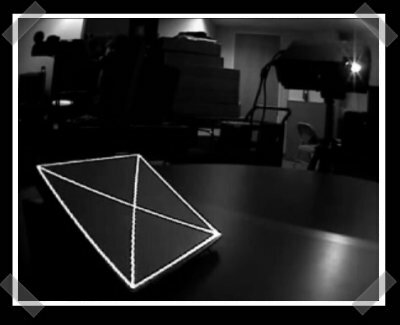 The actual reprojection is achieved by mapping the camera space to the projector space and fitting the point positions to identical virtual models. But it can get tricky without overdetermined sampling. This also burns resolution like nobody’s business. The actual resolutions with a close up are pretty miserable. Lots of anti aliasing going on too. Auto calibration is not a new idea. 1). For moving targets you don’t have to use the same search scheme as you already know roughly where the corners of the targers are (or were). You just need to be able to search those specific areas within a radius. 2). There is no reason why multiple targets could not be placed in projection view, once calibrated each could have a different image projected onto each of them. 3). The target screen are currently teathered to a compute, again not needed. The electronics could be fully self contained (not that difficult to code) and result sent to projector(s) system wirelessly (Bluetooth for example). 4). In the same manner that they use two projectors onto a wide target with 6 sensor, you could make a modular screen built from square panels where you just assemble the size screen you need and point a barrage of projectors at it to get some really (!!!) high resolutions. A fantastically simple idea. Good hack! I see great future for this.. Many CRT projectors have had this feature for many, many years and those of us who have set up CRT projectors more than once know that they are not as good as doing the setup manually. The CRT projector system consists of about 5 different ways to focus the electron beam and 4 different ways to control optical focus, multiply that by 3 tubes and you have the number of settings that auto-convergence cannot fix. Convergence (getting the 3 tubes to overlap) is about 10 settings pr. tube. The tricky part is that several of these settings interoperate so several iterations are needed to get the perfect setup. This type of technology, using optical sensors to warp and blend projectors, is already commercially available from at least two companies. Iridas and 3D Perceptions. I’ve been using them to project on cylinders and spheres. However, they take about 30 seconds to auto-align and they are too expensive for everyday use. The speed of this is very impressive. If its being done with inexpensive hardware, thats equally impressive. You can’t use reflecting targets because they would be visible to the viewer. When I worked at IBM we had a system that would project onto multiple interactive surfaces using a projector and mirrors. The problem was always calibration. You’d mount the projector, motorized mirror, and position the surfaces to project onto and then calibrate. If anything got touched then you had to do the calibration all over again. This tech would make it so that all you had to do at the start was a very basic alignment and then the system could handle the calibration as needed. The demo itself was very cool. We had a clothing store of the future set up for a major retailer and the projector could put a screen on the wall, on the floor, and on the jeans display depending on where the customer was. The jeans display was interactive so that you could point with your finger and it would show different options. I think this is amazing but I don’t understand how it works. I have never seen a projector that has this sort of calibration via user-accessible menus. I mean, unless the team also re-wrote the projector code, I am stumped. I understand *how* the system works, I just don’t understand it’s able to tell the project to do anything other than zoom in and out, squeeze sides, or focus. I really like the Hack-A-Day community because there is a high density of very smart people with an imagination that rivals or surpases that of the recognized research community. In the case of this demonstration, the calibration is not bing done in the projector. The video is passing through a computer first. The computer is processing the video and warping it to fit the projection surface. The projector is just being a dumb projector and not doing anything different. wow. that has to be revolutionary! This is what I’m talking about all I want to know is how much and where can I buy this technology. Currently, as far as I know, you can’t buy this software. If you were to check out shaderlamps.com you can request a copy of their callibration software, and from what I can tell, it is pretty similar to what Johnny was using for his callibration technique (which he worked with a few of the shader lamps people with). I have tried to contact johnny directly through the e-mail on his website, but no luck so far. I want to try and use this callibration technique in a real-world, entertainment aspect. Being a VJ, callibration is not really that important, but to be able to transform a stage into something that is immersive both for the audience, and the performers, this would be absolutely vital. I certainly hope that research continues for this, and it someday, soon hopefully, becomes available to users. Any luck getting in contact with any of these folks? Dies ist eine gro?artige Geschichte. Danke! i want to stack 2 projectors 3200 lumenes? what is the cheapest solution of software and hardware ? jhonny chun lee has good metods. Please is very imprtant for me can anyone help ? i had read three opcion: vioso wings , scalable displays, chung lee with sensors have anyone the software ? it is not for comercial use please help emergency story!